Letarte rashguard in solid microfiber. For in-store inquiries, use sku #2555419. 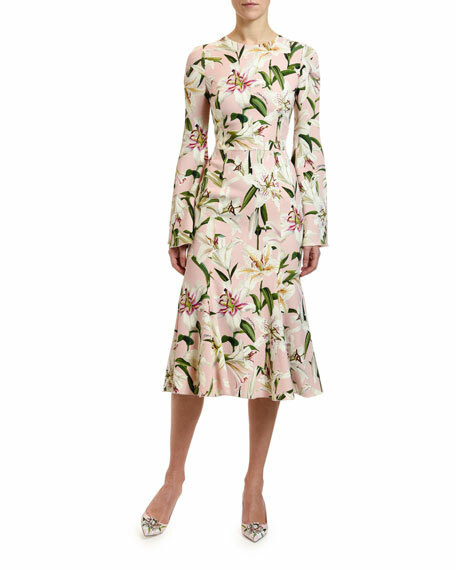 Dolce & Gabbana dress in lily floral-print stretch cady. Approx. 29"L from waist to hem. High, round neckline. Long, flared sleeves. Fit-and-flare silhouette. Bias flounce hem. Hidden back zip. Rayon/spandex. Made in Italy. Fendi dress in ombré floral print silk. Crew neckline; lace insets at chest. Long sleeves. Ruched at waist. Faux-wrap front. Mini length. Back zip. Silk. Embroidery, viscose/nylon. Made in Italy.